The story of King Parikshith stands as testimony to this statement. Parikshith, Arjuna’s grandson and Abhimanyu’s son, was the last surviving heir of the Pandavas after the Mahabharata war. When he was still in his mother’s womb, Aswatthama, the son of Dronacharya, used the most powerful weapon, the Brahmastra, against him with the intention of destroying the Pandava lineage. 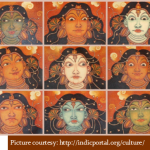 However, his pregnant mother Uttara surrendered herself to Lord Krishna, and the benevolent Lord who never lets down those who surrender to Him, used His Sudarshana Chakra to save her and her unborn baby, Parikshith. When Parikshith was born, he was given the name Vishnuraatan (one saved by Lord Vishnu). He became the king of Hastinapur after the Pandavas, and ruled the kingdom justly. He managed to reduce the effects of kali yuga (the Age of Vice, that had set in after Lord Krishna returned to His divine abode) and established righteousness in his kingdom. However, in this age of Kali, even the wisest and greatest soul can easily lose sense of what is right or wrong. So did Parikshith! Once when he was out hunting, he became very thirsty. He looked around for water and spotted the hermitage of Sage Sameeka. The sage was lost in meditation and oblivious to the world. 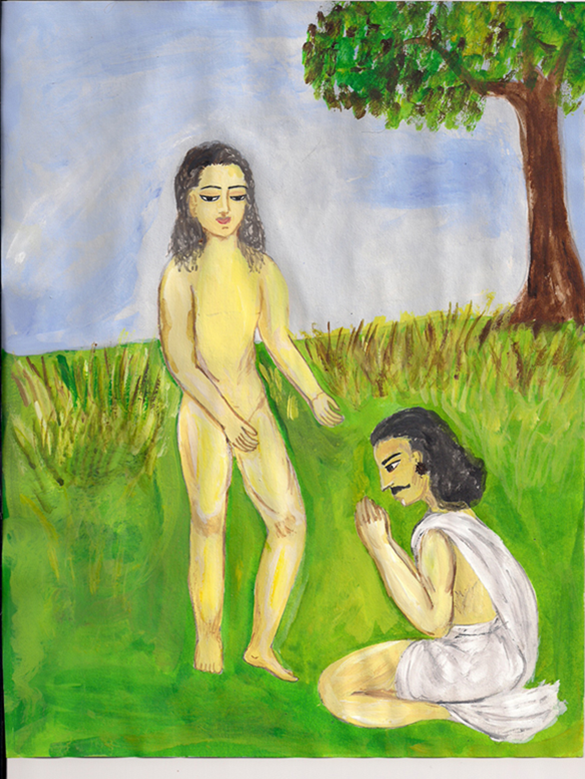 Parikshith approached him for water but when the sage did not respond, he felt insulted. So, in order to test his contemplative state, he put a dead snake around the sage’s neck. When the sage’s son, Shringi learned about the incident, he became angry and cursed Parikshith that he would be bitten by a snake and die on the seventh day. Meanwhile, Parikshith, being a sadhu, repented deeply for his mistake. So when the news about the curse reached him, he accepted it whole-heartedly as just punishment for his act. And instead of trying to find ways to counter or nullify the curse, he decided to use the time he was given—seven whole days—to find a way to reach the Lotus Feet of the Lord. He crowned his son as the king, renounced his kingdom, and not knowing how to attain the Lord in just seven days, decided to fast unto death on the banks of river Ganges as he prayed for the grace of Lord Krishna. 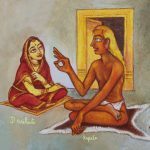 It was then that, by the Lord’s grace, Sri Shuka, the great jnani and son of Veda Vyasa, arrived there as Parikshith’s Guru, determined to lead him to Liberation in seven days. From that moment onwards, Sri Shuka poured the nectar of Srimad Bhagavatam—which contains everything right from expositions on karma, jnana, bhakti and raja yogas, description of creation and incarnations to heart-rending stories of great devotees and finally the nectarine lilas of Lord Krishna Himself—into Parikshith’s ears non-stop. 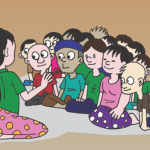 Sri Shuka’s narration was so sweet and fulfilling that Parikshith was immersed entirely in his words, without a thought about food, water or sleep. 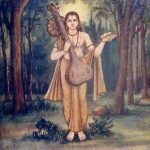 In the mere seven days he had, Parikshith had no time to put into practice all that he had heard about the different paths to reach the Lord. 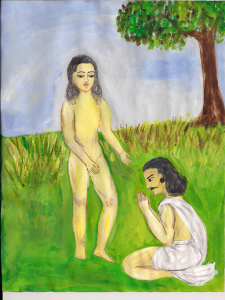 Yet, at the end of the seven days, when Sri Shuka completed his narration, Parikshith attained ‘immortality’ even before the snake came to bite his mortal frame. He achieved this simply by listening to the glorious Srimad Bhagavatam, and that is the greatness of this wonderful scripture. This past Purnima day, the Bhadrapada Purnima, is the day that Parikshith attained the Lord, over 2000 years ago. Srimad Bhagavatam is indeed the greatest treasure that the Lord has bestowed on us in this Age.